For most of my life, I’ve loved this time of year. My mom always went overboard when I was younger; she threw festive parties, made our house look identical to the holiday section of an interior design catalogue, and baked cookies for 25 days straight. I was into it, to say the least. I also vividly remember my dad seeming rather unenthused with all the festivities. I just assumed he was grumpy and worried about spending money (we didn’t have a lot, even though he consistently worked overtime throughout the holidays). I didn’t think much about his less-than-eager attitude when I was a child. I’d only notice when I wanted him to help me set up our front yard’s ridiculously detailed “Christmas village” while singing “Rockin’ Around the Christmas Tree” on repeat. Only a couple of weeks ago, he finally told me the poignant reason why he seemed discontented around the holidays. I want to keep the personal details private out of respect for my father, but his negative emotions stem from the way his own dad treated him and his siblings around Christmas time when they were kids. It was a rough patch in his life, so he never looked forward to the usual holiday merriment often associated with the season. My dad loved spending time with his family and seeing his children’s excited faces on Christmas morning — but that didn’t make his past memories any less difficult to swallow. Constantly being asked, “How on earth could you not love Christmastime? !” didn’t help either. We lost my mother to cancer a couple months before the holidays last year. Before my mom passed, I couldn’t imagine myself not looking forward to Christmas. Now that the season is quickly approaching, I find myself in a more complicated relationship with it. With such a large piece of my life missing from my beloved holiday routine, things have simply…shifted for me. I still look forward to seeing my family and friends, but my sugar plum-induced thrill for the season is M.I.A. And surprisingly, I’m very much okay with that. Now that I’m not necessarily overwhelmed by holiday cheer, I’ve realized that people tend to make large generalizations about how others should experience this season. We just expect everyone to be consumed with joy, from Thanksgiving to the New Year. When I’ve told people that I’m not exactly thrilled to go to three different Christmas celebrations this year — or that I’d rather just stay home alone with my fiancée — I’ve been met with confusion and awkward silences. Now, I wonder why it can be so hard for other people to accept that we don’t all look forward to the “most wonderful time of the year.” Or that some people have a different definition of “the most wonderful time of the year.” Or that some people avoid this time of year like the plague for very valid reasons. I always have a hard time with November & December because years ago, 2 close people in my life passed away within 6 weeks of each other. I feel foolish for only realizing this phenomenon after I went through a dark time in my own life. Have I previously been disrespectful to people who told me about their lack of holiday enthusiasm? Did I think it was appropriate to respond by singing Christmas carols to “rile them up”? Sadly, it’s probable. But all we can do is our best, and that’s why I’m here now, sharing what I’ve learned with you. 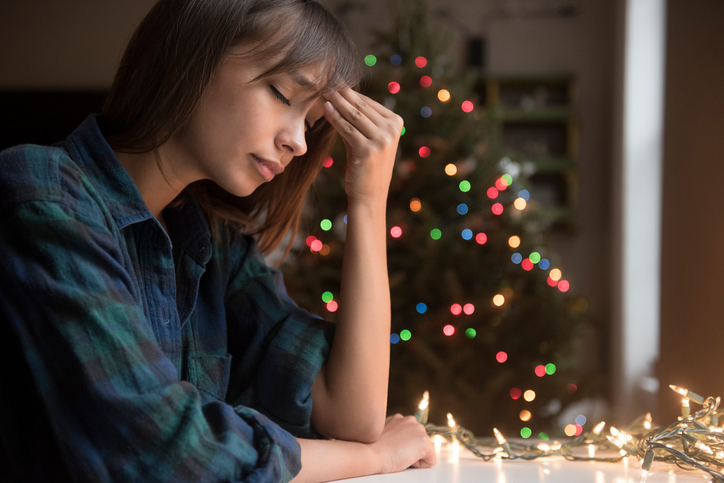 When discussing the holidays with loved ones, friends, or strangers, remember that some people won’t relate to your overwhelming excitement for the upcoming season. There are so many people who have experienced trauma. They may have lost someone important to them, and the holidays remind them of that undeniable fact on a very deep level. Remember that there are plenty of people who have strained relationships with their families, or who don’t have a family of their own to share the season with. There are people who have been struggling to make ends meet all year long and cannot fathom spending an extra penny this December. There are also some people who flat out do not enjoy the holiday season, simply because they do not enjoy the holiday season — and that’s fine. It is not your job to “reignite” their enthusiasm, either. It is your job to be a good person and respect that people can feel however they want about whatever holiday they celebrate. And finally, I leave you with this: Being more mindful of those around you won’t take away any of your holiday joy. So try it. You might make someone feel a whole lot better during a difficult part of the year.